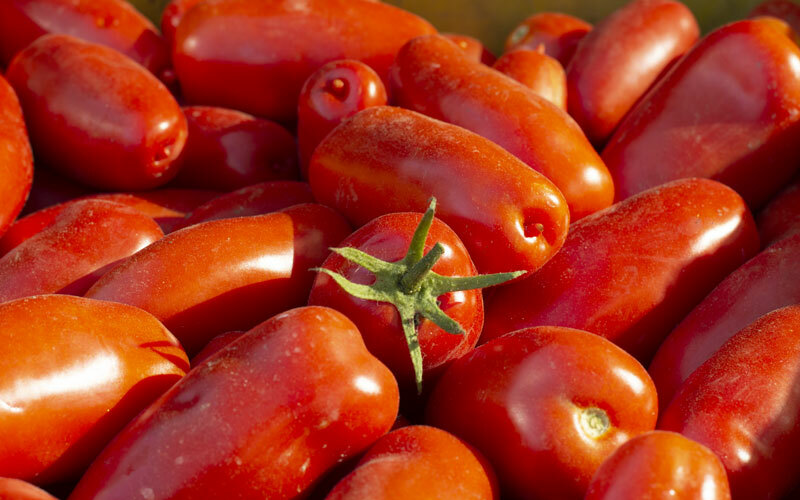 San Marzano tomatoes are widely recognized by top chefs, foodies, Italian cooks and food aficionados as the gold standard for taste, but what makes them so special? San Marzano tomatoes get their name from the town where they were born, San Marzano sul Sarno, which is located in the Campania region of southern Italy. Characteristics of San Marzano tomatoes include a thicker tomato wall, less seeds and less acidity than other tomatoes, making them ideal for authentic Italian cuisine. 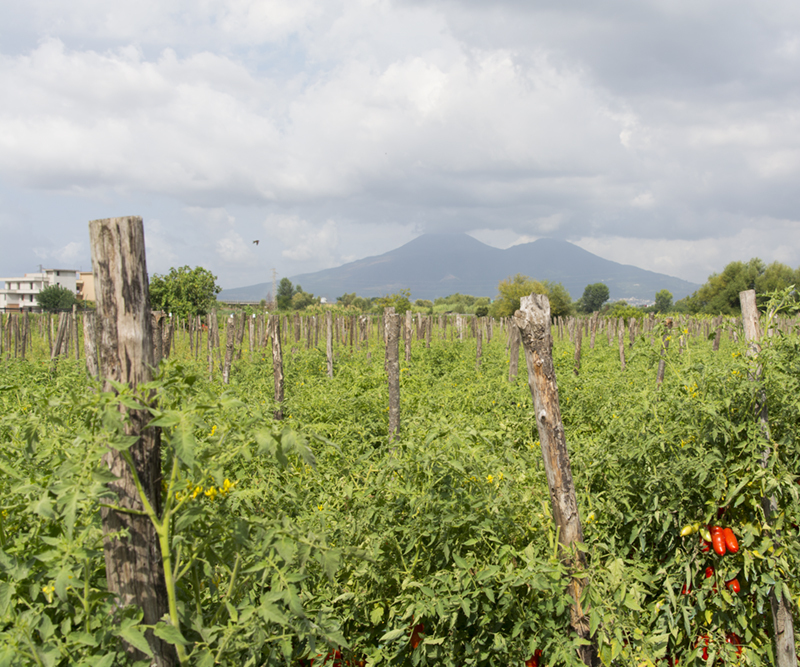 San Marzano tomatoes thrive in the designated area of Italy because of the Mediterranean microclimate, high water table, and fertile volcanic soil. Truly authentic San Marzano tomatoes from Italy adhere to strict conditions and guidelines in terms of their growing, selection, and processing. 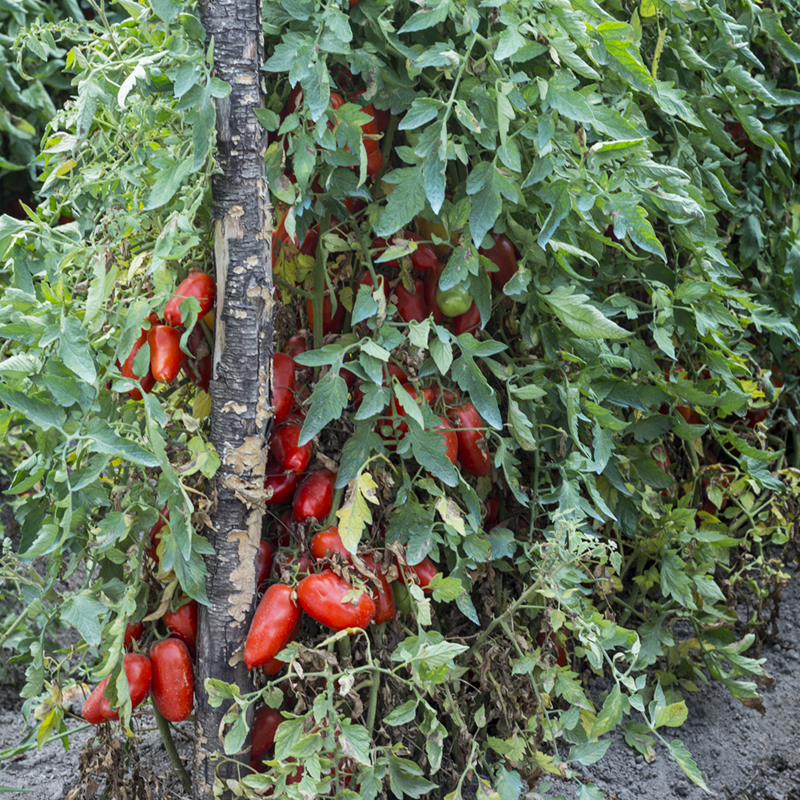 Certified San Marzano tomatoes must be obtained from plants of the same ecotype, grown within a specific territory allowed in Italy, and contain characteristics that comply with standards set in Italy. Cento Certified San Marzano Tomatoes have always been, and continue to be grown and produced in the Sarnese Nocerino area of Italy. They continue to follow the same premium-quality standards that Cento has always stood by, the standards that made us the leading brand in the United States for San Marzano tomatoes. 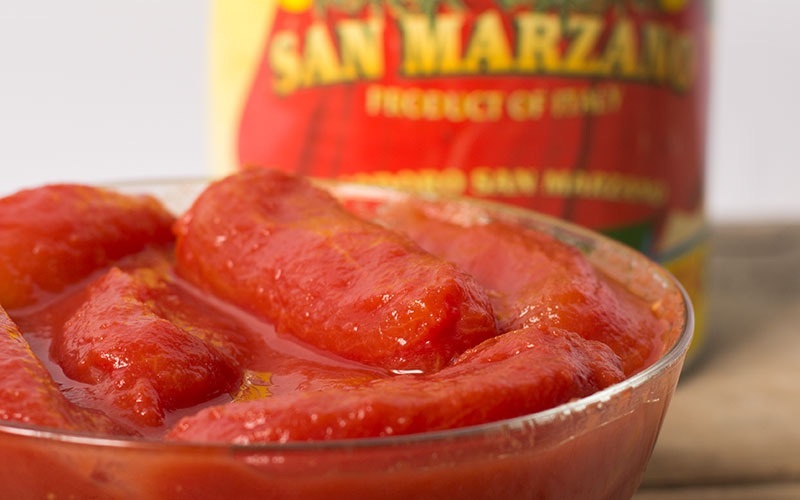 San Marzano tomatoes are regulated and certified authentic by an independent third party, Agri-Cert, using the guidelines created to regulate San Marzano tomatoes in Italy. 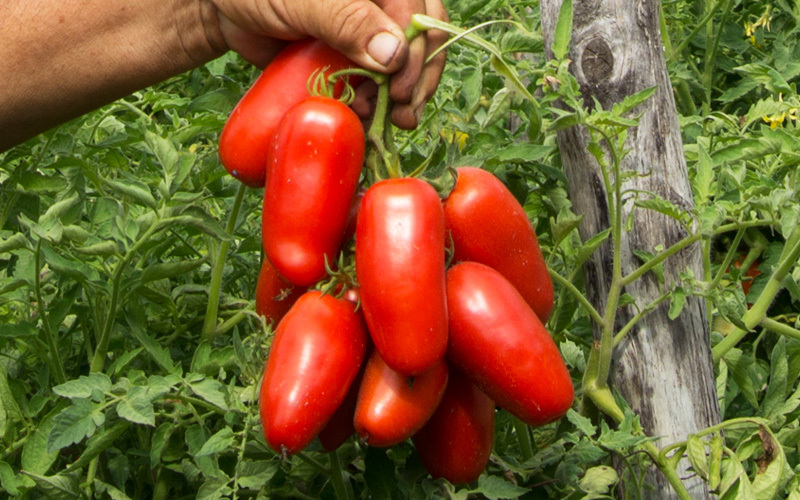 These guidelines were created to help differentiate a true San Marzano tomato that follows the criteria from other varietal Italian tomatoes grown outside the designated region or domestically. This ensures shoppers aren’t misled by non-genuine products who use the San Marzano name in their products, which, without following the strict criteria, may be inferior quality or contain a different flavor profile. Cento Certified San Marzano Tomatoes begin with the seed selection. Prior to each growing season, we carefully select our farms and distribute our seeds to select farmers. Our commitment to sustainability requires each of our farms to practice crop rotation, which helps the land remain fertile by not using the same key nutrients each growing season, reduces soil erosion, improves soil stability and increases crop fertility. San Marzano tomatoes thrive in warmer climates, which is why the Sarnese Nocerino area of Italy is the ideal location to grow them. The Agro Nocerino Sarnese is a geographical region in Campania between the provinces of Salerno and Naples. This area is low-lying, bound to the south by the Lattari Mountains, the east and northeast by the Picentini Mountains, and the west by Mount Vesuvius. The soil in this designated area is mostly covered by pyroclastic materials of volcanic origin, which provides sufficient quantities of organic matter that in turn yield high fertility of the tomatoes. The high water table of this area comes from the presence of numerous springs of different depths, and water for irrigation is derived from wells that feed directly from the groundwater. Although the area isn’t prone to heavy amounts of rainfall during the summer months (harvest), the relative humidity in the area from the close proximity to the sea keeps the plants from drying out. Cento’s facility in the Sarnese Nocerino area of Italy is approximately 22 miles southeast of Naples, sitting in the shadow of Mount Vesuvius. The proximity of the facility to the fields allows the hand-picked crop to be delivered within hours of selection, then immediately processed and canned. 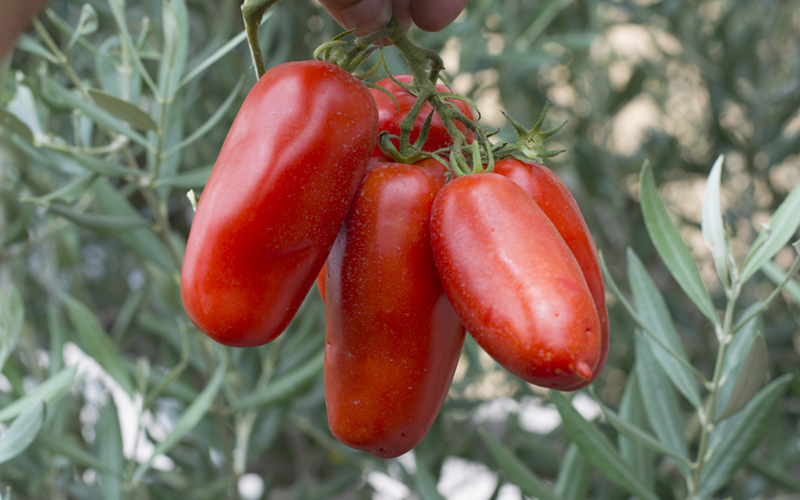 San Marzano tomatoes are similar in appearance to Roma tomatoes, but thinner and more elongated. The walls of San Marzano tomatoes are thicker, but contain fewer seeds, which makes this tomato varietal less acidic and sweeter than others. Guidelines set state true San Marzano tomatoes must have the traditional oblong shape, measure 6-8cm in length, and have a uniform, bright red color. 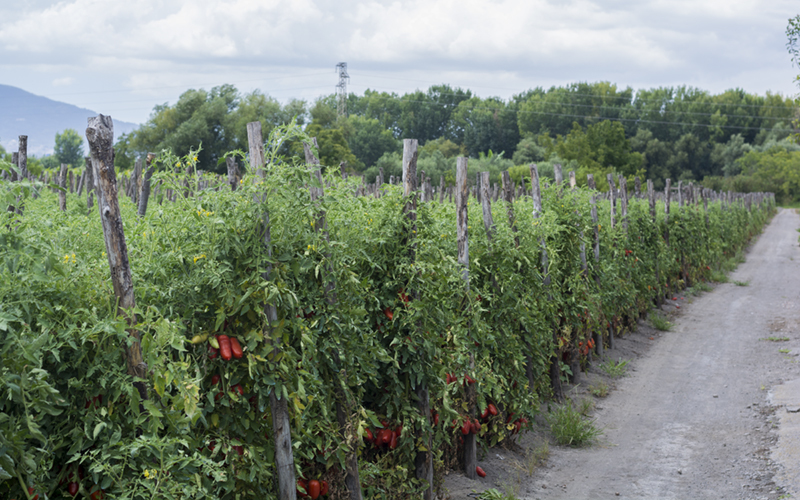 Because Cento Certified San Marzano tomatoes are hand-picked only when ripe, no over-ripe, blemished, or rotted tomatoes are even brought into our facility; only the best of our tomatoes are picked in the field. 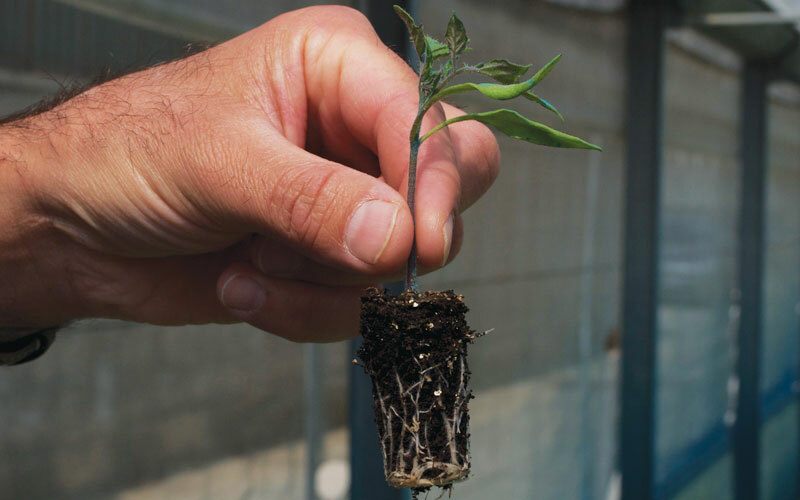 San Marzano tomato plants are hand-tied to wooden poles with natural materials to ensure our plants aren’t touched by anything that could harm them. To aid in the growing process, our plants are tied three times, which allows them to grow to the fullest capacity at 6-7 feet. Standards state harvesting of the tomatoes in July must be done exclusively by hand as the tomatoes reach full ripeness. Harvest takes place on several occasions and the tomatoes must be transported quickly to the processing plants in plastic containers. The first stage of processing involves washing the tomatoes. The tomatoes are then steam-peeled, an all-natural process that has been used in Italy for centuries. Steam peeling is environmentally friendly and uses only hot water, no chemical by-products. Cento has used this method for generations and will continue to exemplify the highest industry quality and sustainability standards. The tomatoes are then sorted. At Cento, our tomatoes are hand-sorted to ensure only the best tomatoes are provided in our cans. The tomatoes are then packed into BPA-free lined cans with the addition of the allowed packing medium: a light tomato puree, made of only San Marzano tomatoes. Fresh basil leaves and a minimal amount of salt are allowed under the guidelines. Once the tomatoes are canned, the cans are sterilized and cooled.